There were several notable developments that came with the release of NPD’s official sales numbers for July. Overall it was the weakest performance for video game sales since 2006 and NCAA Football 12 easily took first place. It was already known the game was seeing increased sales over the prior year – 17% for the first two weeks – and it ended up finishing 15% higher when comparing respective first month numbers. What even that small difference (going from the 17% to 15%) displays however is how NCAA 12 has been weakened by word of mouth along with the effect of pre-order deals and the ‘Online Pass’ that have pushed consumers into situations where buying games as they release makes more sense than waiting for price drops or used copies. The first two weeks of NCAA Fooball 11 accounted for 89.7% of its first month sales while the first two weeks of NCAA Football 12 accounted for 87.9% of its first month sales. That obviously isn’t a huge difference but does reflect the trend and sales prospects going forward. Regardless EA Sports is surely pleased with moving 796K copies as the performance of the series had really stagnated sales wise though this HD console generation. NCAA Football 12 benefited from coming off a well received year, had some big pre-order deals including $20 promotional credits from Amazon and Walmart which made the game essentially $40, tied in exclusive pre-order jerseys, released during the NFL lockout, and was helped by Madden NFL 12′s release moving to the end of August. 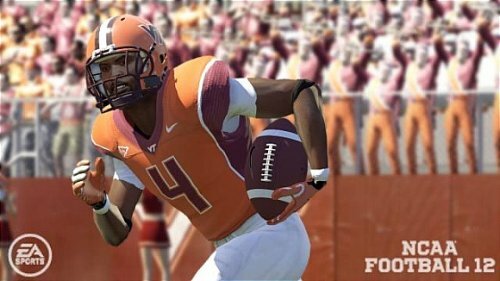 All of those were factors in its early success but could result in weaker sales in the coming months and trouble for NCAA Football 13 considering the relatively poor word of mouth due to all of its severe issues. Meanwhile NBA 2K11′s astonishing run in NPD’s Top Ten charts has come to an end. NBA 2K11 had been amongst the highest selling games for nine straight months – something unprecedented from sports titles in recent years. The end of the NBA season obviously was the main reason for its decline and not so much the lockout considering it hasn’t really had any impact yet. Curiously MLB 2K11 made its first appearance in the Top Ten by finishing in sixth place. This is a game that has struggled to meet even its own low sales projections and has 2K Sports eagerly anticipating the end of the third party exclusive license (next year being the last year of the contract). While it was a complete surprise to see it on the list the reasoning for that would be its seven platforms, being in the heart of the MLB season, and the weakness of all other video games in July which allowed a middling performer to enter the mix.